Place everything in a large saucepan and bring to the boil. Simmer gently for 1.5 hours, skimming away any thick surface froth. Remove the chicken carefully, pull the thigh and leg joints away and shred the meat from the bones. Remove the bouquet garnis/herbs and then blitz the soup until smooth using a stick blender. 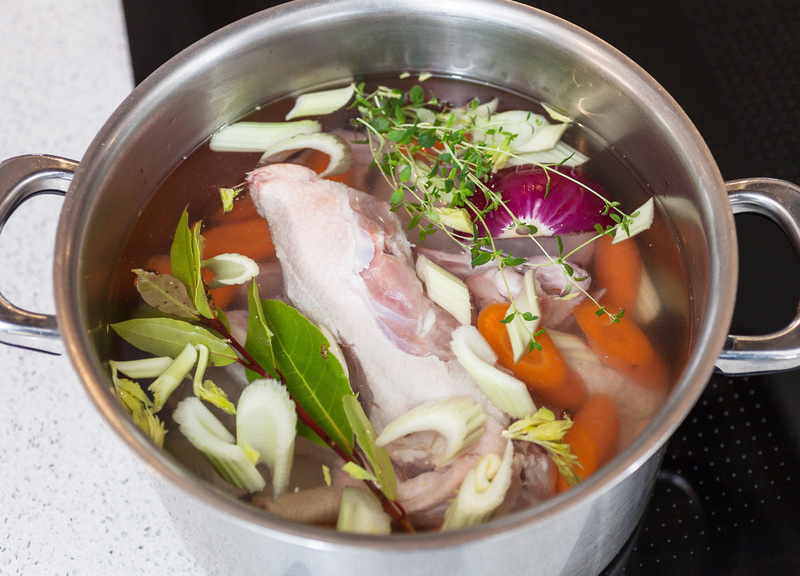 Add the stripped leg and thigh chicken meat to the broth, keep the breast meat for tomorrow’s supper or lunch – see my Spicy Ramen Bowl recipe next. Gently warm the soup and season with the lemon juice and salt to your taste. Serve in warmed bowls with crusty bread. Optional – fennel bulb, celeriac and leek, all chopped – you can also use veggie trimmings such as the tops of leeks etc.